It was the first day of summer. How to best celebrate the day? At Madison Square Park, the answer was: work outside, of course! Seeking a way to connect with customers who enjoyed the outdoors, but spent most of their time indoors, L.L. 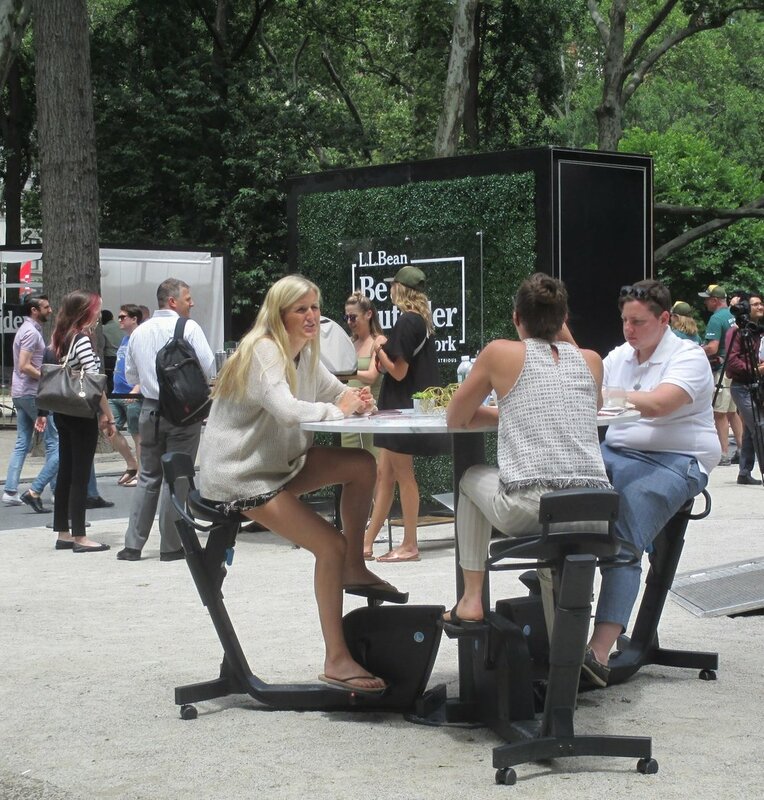 Bean partnered with coworking provider Industrious and workplace strategist Leigh Stringer to present a two-day popup with a singular message: working outdoors is healthy and we should do more of it! Why? For many of us, it’s because our exposure to the sun, a great source of Vitamin D, is limited. No surprise, since we spend 95 percent of our time inside, nearly half of that related to work. No wonder my doctor is prescribing Vitamin D for nearly all her patients. A new survey from L.L.Bean found that while most people enjoy the outdoors, many of them rarely take time to work outside. In fact, 87 percent of indoor workers consider themselves someone who enjoys the outdoors, but 75 percent of indoor workers rarely or never take time to work outside. Yet studies show that when we spend time outdoors, we are more productive, more creative and happier. That’s why L.L.Bean has partnered with Industrious, and leveraged its well-established expertise in design, productivity and the coworking industry, to create the first-ever outdoor coworking space to provide an opportunity for people to experience the benefits of working outdoors. Cycling desks were one option. More than 700 people participated in the two-day event, which included sheltered but open options for individual workspaces and group meeting areas as well as space for team-building activities, lounge settings for casual collaboration and even cycling desks. Adam Stoltz and Jen Samel, colleagues at a nearby workplace strategy firm, were collaborating on a project on the outdoor chairs. What brought them out? “I love the idea of new innovative approaches that enable people to recognize flexibility and take advantage of both indoors and outdoors,” said Stoltz. New York City kicked off the pilot popup, which then traveled to Boston, Philadelphia and Madison, Wisconsin before returning to L.L. Bean headquarters in Freeport, Maine. “I’ve spoken to the Bean people about DC,” joked Leigh Stringer, author of The Healthy Workplace, who is based in the nation’s capital and partnered with L.L. Bean and Industrious on the project. She emphasized the goal at the heart of L.L. Bean’s initiative. “They’re not creating some work product line,” Stringer noted. “They’re an outdoor company. “I love that,” she added. Workplace strategist and Healthy Workplace author Leigh Stringer partnered with L.L. Bean on the Be an Outsider at Work coworking popup. Through extensive research on the history of work and the impact of nature on wellbeing, productivity and creativity, L.L. Bean documented why nature is important, giving rise to the message “You should get outside during the workday, not just evenings and weekends." The movement is gaining momentum, as evidenced by the the growing influence of biophilia in the workplace, reported Stringer, citing examples such as Amazon’s Spheres and others featured in a handbook L.L. Bean produced in collaboration with Industrious and Stringer. Results of a customer survey of “9 to 5” workers in America were revealing. “We asked people ‘What would enable you to work outdoors? Do you even want to work outdoors? While resistance to working outdoors ranged from safety concerns to an extreme fear of mosquitoes, the majority of inhibitors centered around work itself, according to Stringer. And while some reluctance was technology-related, such as concerns about access to WiFi and fears of glare, culture and inertia accounted for some of the greatest resistance. “We also asked people: ‘Do you have an outdoor work setting that works today?’ Those who did were much more likely to say ‘Yeah, I can be productive there.’ Those who didn’t have a workspace couldn’t make the connection,” said Stringer, supporting the concept that space does matter. However, the linchpin is to build it and run a pilot that shows it in use. “It’s almost like ‘If you build it they will come,’” she said, as long as people know how Wi-Fi works and see places to plug in and take shelter from rain. “You have to get suntan lotion, glasses, make sure your phone is charged, all that good stuff,” she added. To counter potential resistance, the strategy was to make solutions visible for people, including showcasing “the big money shot” in Madison Square Park on the first day of summer. While the popup demonstrated many types of work that can be done outdoors, the survey revealed that for many, their preferred outdoor work activity was for creative meetings and one on one meetings. Having a heart-to-heart outdoors or on a walk with few barriers leads to a more open conversation, Stringer noted. Being offsite in a public setting with a degree of ambient noise brings a certain level of privacy as well. To my knowledge, no particular measurement of productivity or creativity was taken of the users. But a dose of sunshine and fresh air seemed to do a world of good for many. If nothing else, the exhibit brought attention to the pluses of working outside. I think we will continue to see more employers, coworking spaces and serviced office providers providing outdoor space. We can only hope the settings are as well done as the L.L.Bean/Industrious popup. As lovely as the fresh air and sunshine is, it also brings many factors that cannot be controlled as easily as indoor office space. Which was certainly top of mind as I sat in City Hall Park eating my lunch a couple days later. While watching tourists take selfies and a news crew filming a live segment, I was also joined by several pigeons making a nuisance of themselves and flies making themselves known. I wonder if there’s an app for that?